Gallo-Teck is a battery specialist with over twenty years of experience working with battery-based systems. Depending on the goals of a customer, we will use various batteries (such as ROLLS and “Discover”) and inverters like the Xantrex SW system from Schneider Electric to ensure that your electrical needs are met. 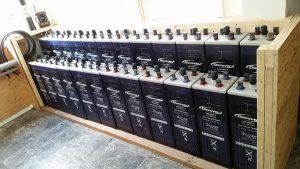 Batteries are storage devices which hold energy and makes that energy available when needed. Inverters are energy conversion devices which are able to turn one form of energy into another. In a grid-connected system, DC electricity is converted from a power source, such as a solar panel, to AC mains power. Any excess power generated is then fed back into the grid. 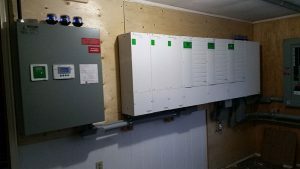 Some inverters will continue to supply a user with energy even if there is a power outage or you lose power to the battery banks connected to the grid. Another option is to build a stand-alone or “off-the-grid” system. To make these systems work, Gallo-Teck will install a power generation source (such as solar panels, wind turbines, or a micro hydro system), an inverter, a battery bank and charger, and a fuel generator. The exact equipment necessary to convert and store energy depends on the energy needs of the customer as well as the amount of energy resource available and any physical constraints. Gallo-Teck is fully insured and licensed electrical contracting company. We offer electrical inspections and consultations to anyone interested in optimizing their electrical options, as well as products and installations. Contact us today for more information on how we can help you get the right system for your needs.